The only loser for the year so far lost -9.09%. Inception to date the service is up 158.28%. We feel by year end this could be over 300%!! Options Index Trader uses a little-known indicator based on "Alpha Intelligence," the same technology the CIA used to hunt down Osama bin Laden. This Indicator has shown 79.25%* accuracy in predicting which way any stock on the S&P 500 will move in a given day. In addition to his impressive 95% win-rate in 2014, this Indicator helped veteran trader James DiGeorgia and his trusted trading partner and Chief Options Strategist Geoff Garbacz produce yearly gains of 304% and 105% in recent years. Together James and Geoff bring more than 50 years of experience and an incredible track record of spot-on predictions and winning trades to readers of Options Index Trader , using technology to help determine the biggest moves indices will make, in time to profit from these moves. You get access to James DiGeorgia - a 34-year veteran of the gold and energy markets, who called the tech wreck ... $1,000 gold ... $100 oil ... the credit crisis of 2008. His 5 laws of gold trading helped him make his first million by 21 ... build a $20 million-a-year investment company in just 5 years ... and post 584% average gains a year for 8 years running in a little-known sector of the gold market! You get access to Geoff Garbacz - the options master and "secret weapon" behind many of the world's top hedge funds. In fact, he's been paid up to $30,000 for his trading recommendations by three of the top funds in the world. You'll never have to wait months or years for a trade to pay off. In fact, we often get you into and out of a trade in as little as a day. You'll get weekly position monitoring ... You'll never have to sit in front of the computer screen monitoring the action in the options market. Instead, I'll do all the work and give you a quick update if we need to make changes to any of our positions. Like when to take a profit off the table, or cut a loss short. You get immediate, 24/7 access to Option Index Trader Members-Only Website : The "Welcome Aboard" email you'll receive in a few minutes will also contain the link and the password that will give you access to our current issues, flash alerts, our Position Tracker, and more! You get our 100% Money-Back Guarantee: Use Gold and Energy Options Trader to go for all the profits you like for the next 60 days. You must be thrilled with your profits or cancel for a full refund. Plus, if you change your mind later on, you can cancel at any time for a refund on the remaining portion of your membership. You take absolutely no risk by test-driving Gold and Energy Options Trader today, but you stand to reap rich rewards. Plus, you'll have direct access to our professional customer service representatives through dedicated phone and e-mail channels. While they can't give individual trading advice, they'll help you find fast answers to your questions about this service and the trades James recommends. 100% Free Investment Course designed to make you a Smarter Investor and Trader! Not One, but Four Free Premier Investment Courses! Single-Stock Futures - Learn what futures contracts are and how they work. Technical Analysis - train you on how to use technical analysis to become a much STRONGER MORE PROFITABLE TRADER. As a publisher of a financial newsletter of general and regular circulation, we cannot tender individual investment advice. Only a registered broker or investment advisor may advise you individually on the suitability and performance of your portfolio or specific investments. In making any investment decision, you will rely solely on your own review and examination of the facts and the records relating to such investments. Past performance of our recommendations is not an indication of future performance. The publisher shall have no liability of whatever nature in respect of any claim, damages, loss or expense arising out of or in connection with the reliance by you on the contents of our web site, any promotion, published material, alert or update. The editor, publisher, and directors of The Options Index Trader flatly promise no front-running. We will not initiate a position in any stock we have recommended for 10 business days before our original recommendation and 10 business days after any subsequent recommendation. Anyone who does is fired immediately. We love the securities we recommend and we can not wait to invest in them ourselves but YOU ALWAYS COME FIRST. All profit examples are hypothetical, assuming that subscribers bought and sold at the time the recommendations were issued. Actual results can and do vary based on day of execution and commission charges. There is a very high degree of risk involved in trading. Past results are not indicative of future returns. The Options Index Trader and all individuals affiliated with The Options Index Trader assume no responsibilities for your trading and investment results. Options Index Trader offers an unconditional 60 day guarantee. During the initial 60 day period of your subscription, if you wish to cancel for any reason whatsoever, you will receive a full refund. Automatic Billing: By providing your credit card information to Options Index Trader , you agree that charges will be billed to your credit card for the applicable pricing plan you chose. Advance automated billing to your credit card will occur on a cycle (depending on the term you have chosen) on the anniversary of the initial set-up and activation date unless other arrangements have been contractually arranged. You may cancel your subscription at anytime without incurring further credit card charges. If you need assistance with customer service, such as questions regarding your subscription or need to change your address, change or cancel your subscription, simply contact our Options Index Trader Customer Service Department by telephone at 1-888-400-5473 or 1-561-750-4155, Monday through Friday between the hours of 8:00a.m. and 8:00p.m. 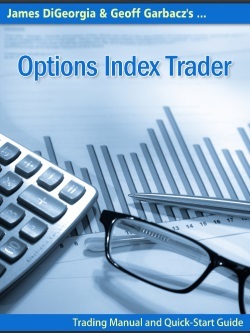 EST or send an e-mail to: customerservice@optionsindextrader.com. All cancellations will take effect immediately and you will receive a confirmation e-mail from us.